Campers should be dropped off at 8:45 am and picked up at 3:30 pm each day. 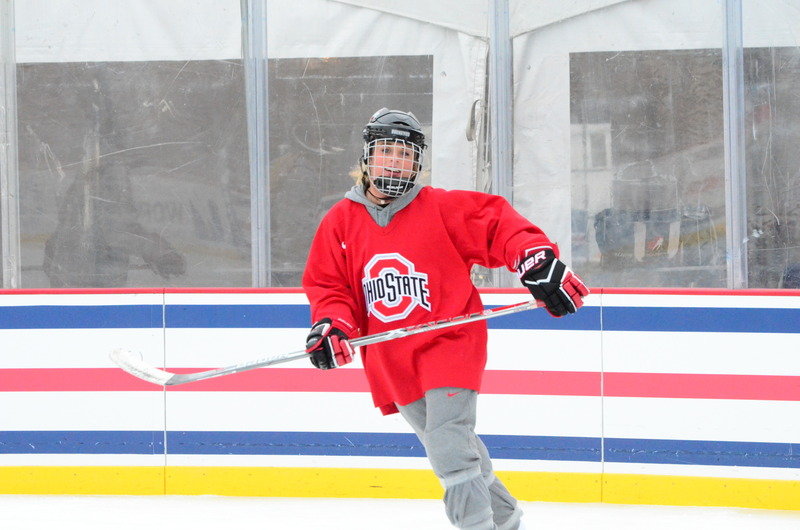 The Ohio State University Women’s Ice Hockey welcomes you to register for our elite ice hockey camps. During our on ice sessions, we will challenge your abilities to make quick and effective decisions using small-area-situation drills, that will increase your knowledge of the game. We will also focus on power skating to improve your edge work and explosive speed, as well as spending time fine tuning the basic fundamentals of our favorite game that are far too often overlooked and under-valued. Our off ice sessions will incorporate competitive and high intensity drills that will enhance your agility, explosiveness, and strength – taking your training to the next level. Our camp balances the right amounts of competition with fun as these young athletes grow in all aspects of their game. The camp will be held on the campus of The Ohio State University, with Ice Sessions in the OSU Ice Rink. The registration fee for the each camp is $425. Daily lunch is available for an additional $50. The U8 Camp is open to any and all girls and boys ages 8 and under. The U10 Camp is open to any and all boys and girls ages 8 – 10. There are a maximum number of campers permitted in each camp, so register early! Full payment is required at the time of online registration. You may register online by visiting OhioStateBuckeyes.com/camps. A 3% processing fee will be added to all online registrations. If registering by mail, please make checks payable to The Ohio State University. Any non-scholastic group of 5 or more that wishes to pay with one check for the entire group must do so ahead of time via mail. Any non-scholastic organization with a group of 5 or more registering the day of the camp must pay with credit card, cash, or money order. No exceptions will be made. Children of The Ohio State University employees are eligible to recieve a 30% discounted employee rate. Proof of employment (BuckID) must be submitted with registration. Groups of 5 or more are eligible to recieve a discounted rate of $400 per camper. Registration must be sent together. Discounts are not available through online registration. Discounts cannot be combined. Please make your check payable to The Ohio State University. All campers are responsible for bringing their own equipment. No equipment will be provided to ANY camper. Daily lunch is available for an additional fee of $50. The Summer Camps are day camps only and no overnight accommodations will be provided. Campers are responsible for providing their own overnight accommodations if needed. Hotel information can be provided upon request. Upon processing of each registration, a confi rmation notice will be sent by email. A packet of “Important Information for Registered Campers” (including the Parent Consent & Waiver Form and Concussion Information Form) will be posted online at OhioStateBuckeyes.com/camps at least 2 weeks prior to the start of each camp. This packet will not be separately mailed to campers. Please check your email regularly, as this is our primary method of communication with campers and their parents. A refund less a $25 administrative fee will be issued for any cancellation received by at least 1 week prior to the start of the camp. The administrative fee and the 3% online processing are not refundable for ANY reason. Because we have to guarantee our number of campers in order to prepare for camp, any cancellation received less than 1 week prior to the start of the camp will not be eligible for any refund except in the case of injury, illness, or mandatory school event, in which case supporting documentation from a doctor or school is required. A camp fee may not be transferred to any other Ohio State sports camp. A camp fee may not be transferred to any other camper. All cancellation notices must be received by the deadline above and submitted by mail, email, or fax – no phone calls or voicemails. All supporting documentation required for a refund to be approved and processed must be submitted within 10 days after the conclusion of the camp session. Refund requests must be submitted on the Refund Request Form available at OhioStateBuckeyes.com/camps. Campers who are injured while at camp but remain at camp will not be eligible for any refund.